Resurrection Man #1 | Hey Adults! Comics! I really like this character. I like the idea of an immortal who is immortal in a different way, he dies, but is instantly reborn fully adult. In the character’s origin he took awhile between incarnations, but that time shortened between each instance until today when it is virtually instantaneous. I like that he has different powers each time he is “reborn” and that he has no idea what those powers will be. It is a neat gimmick that was handled much better than the similar heroes in Dial “H” for Hero where they became full-fledged superheroes with a name they somehow knew and ridiculous, but appropriate costumes. The powers they gained were also often absurd, while the powers of Resurrection Man have been more typical, frequently useless, but never as bad as having candy-based powers the way Dial “H” for Hero once did. That said, I don’t think I like where this new title is starting out. The first issue suggests that Heaven and Hell are upset that he’s been “reborn” so many times and are aggressively attempting to collect his soul. I’m hoping this turns out to be weird alien groups or criminals who want to duplicate his abilities because any time DC gets into the whole “heaven and hell” thing outside its Vertigo titles, it quickly becomes an unreadable mess. Sure, Lucifer was one of the best titles DC has had, but it was always its own series, mostly separate from the rest of DC. Nekron, Blaze, Zauriel are all crappy characters, the “Devil” characters being especially heavy handed. Spectre worked well in his own series when he was treated as a horror genre. Blue Devil and Etrigan have worked well mostly because their connection to Hell was tangential and their powers were well defined and limited. 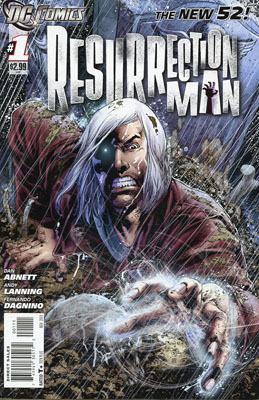 I’d much rather see Resurrection Man as a hero and let them develop interesting stories around his abilities rather than have this whole “heaven and hell” nonsense around him. The Body Doubles, mercenary women who were his adversaries for a time in the old series are back in this one, which gives me hope that it isn’t going to be all mystical mumbo jumbo. They can do interesting things with this kind of character. One of the best things they did with him was in the Year Million event when they had a future him who wore a device on his arm, its purpose was to kill him quickly and repeatedly until he had powers that were appropriate to the immediate problem. Weird story devices like that are reasons to have this kind of character. Fighting over his “soul” is pretty boring in comparison and is an easy way out, freeing the author from doing anything other than trite crap. They don’t have to go down that road and there’s still plenty of room to avoid it, but I worry that they’ll take the lazy way out. This entry was posted in Uncategorized and tagged Body Doubles, Resurrection Man. Bookmark the permalink.